Why dig deep for inspiration when the glittering prize is closer than you think? Shop with Eckersley’s Art & Craft to let your kids discover the world of Scraperfoil and find buried silver or gold treasures by craftily scraping away the surface. A brilliant creation by trusted brand Reeves, Scraperfoil encourages kids to follow the lines or add flourishes of their own. Each set comes with a pre-printed board, scraper tool with handle, a practice piece of board, and a full set of instructions. 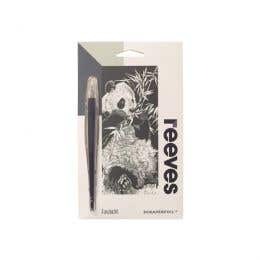 Other Reeves products you can find at Eckersley’s include paint sets, textured gel, glitter glue, easels, gouache sets, pads, painting knives, sketchbooks, diaries and watercolour paper. Outside of Reeves we stock brands like Crayola, Celco, EC, EDUcraft, Derwent, D&L and Jasart - all being synonymous with quality kids arts and crafts. Eckersley’s has been supplying art and craft materials to Australian kids for more than 50 years, and with our online store shopping with Eckersley’s has never been easier. Simply add your Scraperfoils and other chosen items to your online basket and choose your method of shipping. Why not stock up for birthday presents? Scraperfoils make an excellent gift for all ages because they’re unique and easy to use.